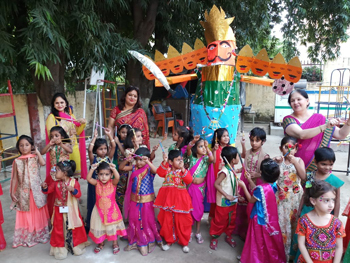 Diwali, the festivals of lights was celebrated at Jopling Road campus today on 5th November 2018 from Classes Montessori to VIII. 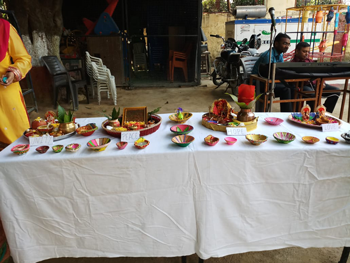 The celebration was started by the Pre Primary students who came dressed in ethnic clothes and brought sweets and colourful diyas and further decorated them too. 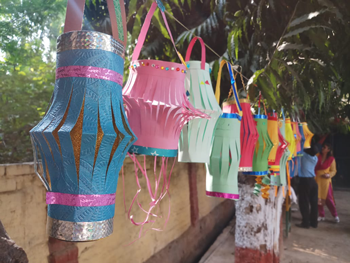 Various inter-house contests such as Thali decoration, Rangoli, and lantern -making were organised in Primary and Junior sections. Every house displayed their items in an innovative way. 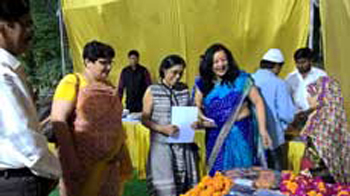 The events were judged by respected Principal ma'am. In the assembly, our respected Principal Ma'am gave away the message of peaceful and bright diwali besides sensitizing the students to the ill-effects of the crackers on environment as well as on animals. 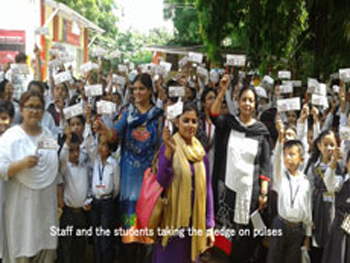 A pledge was taken by students to avoid crackers and encourage their parents, neighbours, friends and society at large. The students talked about the significance of the festival- how good always conquered the evil. The celebration concluded with devotional Aarti and songs. 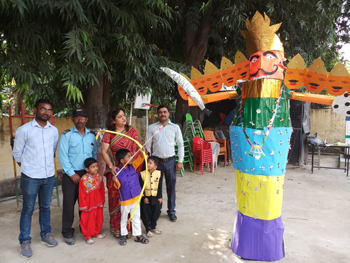 Dussehra was celebrated in the campus to spread awareness among the students about Lord Rama’s victory over the demon King Ravana relevant today as we stand up for upholding righteousness and goodness.The festival signifies the victory of good over evil. The students of Pre primary were dressed in bright colored and beautiful ethnic clothes. 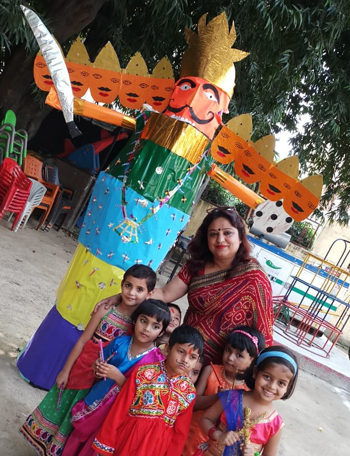 A huge effigy of Ravana was made by the students and staff of Jopling Road Campus in the branch itself.Classes Montessori to VIII gathered in the assembly ground to celebrate the occasion. 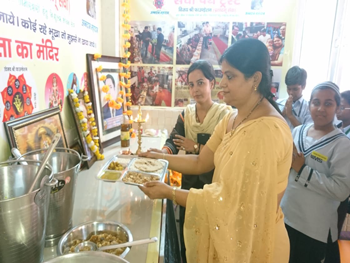 During the assembly students were informed by the Council members about the significance of the nine days of fasting during Navratri that concludes with Dusehra,the tenth day of the month of Ashwin according to Hindu calendar. The festival rekindles the spirit of purity and goodness in our hearts and reminds us of its strength. 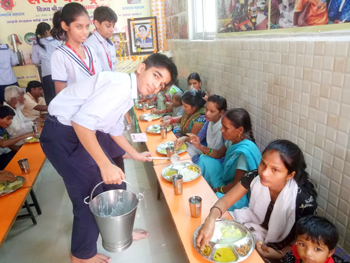 As we also celebrated World Food Day today, the students were also informed about significance and savoring food in general. 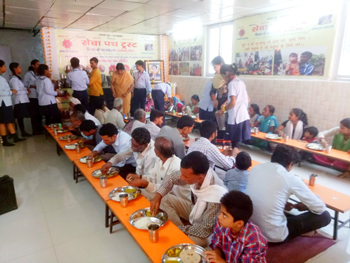 They were instructed that during the festivals the delicious food that they enjoy should not go to waste rather the extra should be distributed among the people who are less privileged. 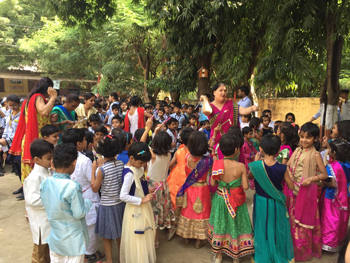 Afterwards, the tiny tots of pre primary section played Dandiya with their partners. Later on they were joined by the teachers and our respected principal ma’am, who danced and participated enthusiastically in the celebrations. At the end, the effigy of Ravana was put on flames by one the students under the guidance of elders, symbolizing the destruction of evil. 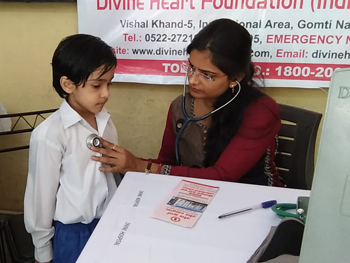 CMS Jopling Road Campus organised a LIVE HEALTHY MEDICAL CAMP in collaboration with “The Divine Heart Foundation and Divine Heart Hospital”, Lucknow on the 10th of October 2018 from 8 am to 12 noon inside the campus for the parents of the school, staff and children .Parents sought advice of the cardiologist and the gynaecologist present. More than 100 parents consulted Dr. Kshitiz and Dr. Ekta. Free blood pressure monitoring, blood sugar test and ECG was available, of which the maximum parents took benefit. 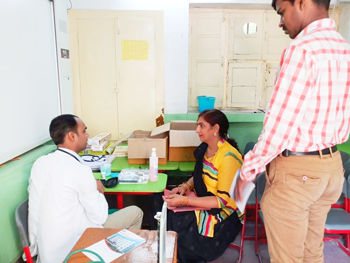 The camp was scheduled along with the parent teacher meeting after the half yearly exam so that the maximum numbers of parents take advantage of the medical services offered in the camp. The parent’s attendance was almost full as the half-yearly answer scripts were shown and therefore maximum parents were present and participated. They were also made a card for further treatment at the hospital at discounted rates. 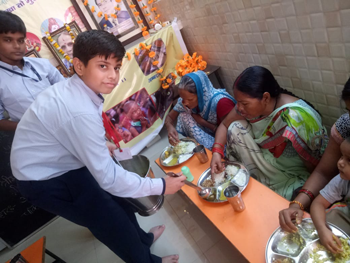 The parents were made aware of healthy lifestyle including 45 minutes of exercise and morning walk, low consumption of salt and staying away from junk food,smoking and tobacco consumption. Diabetes and blood pressure should be kept under control. Keeping all this in mind, living a regulated life and seeking proper medical guidance one can lead a healthy life. 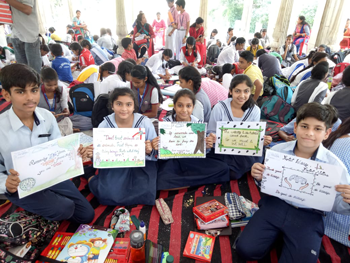 On the occasion of Wild Life Conservation children of Class IV participated in Poster Making Competition and Children of class VII and VIII participated in slogan writing competition at Lucknow Zoological Garden (Baradari). 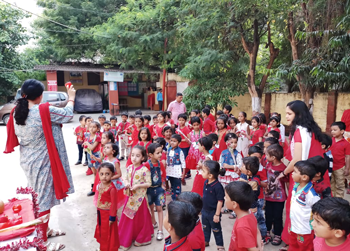 Red Day was celebrated by the tiny tots of our branch on 28th September 2018. 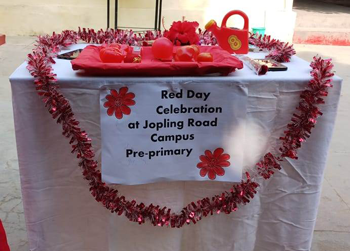 All the pre primary students were wearing red coloured dresses along with the teachers and respected Principal ma’am. 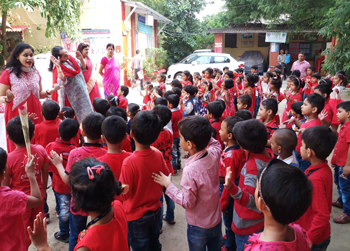 They were gathered outside by the teachers in order to show them the real objects of red colour like vegetables, fruits and flowers etc. Cutouts of red flowers were made and put on their dresses. Activities like colouring, tearing and pasting were also done by the Pre primary section. 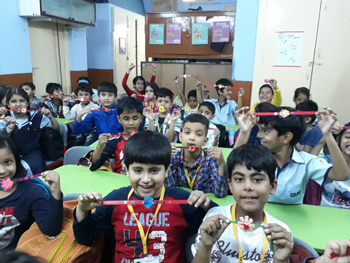 Students of CMS, Jopling Road Campus celebrated Raksha Bandhan festival with great enthusiasm. Students of Pre primary section wore colourful traditional Indian dresses. They were familiarized with the customs and rituals followed on Raksha Bandhan. 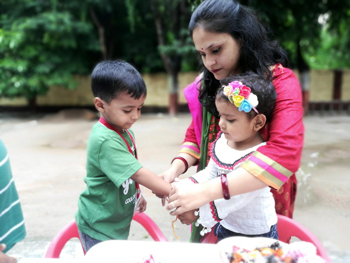 Girls tied rakhi on the wrist of boys, offered candies to them and boys gave gifts in return. 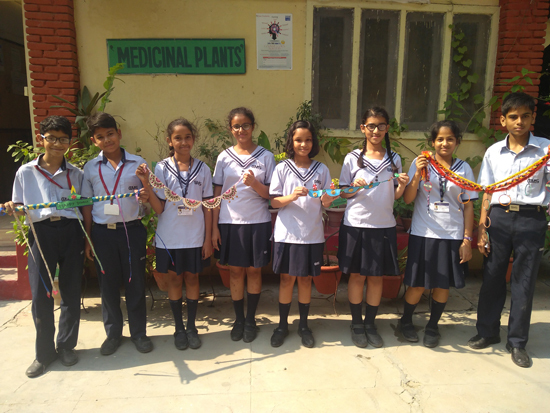 Girls also tied Rakhi to the plants. 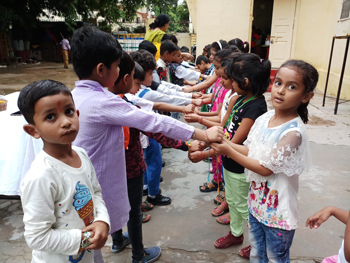 Rakhi making and card making activity was also organized in Primary section and the children were told about the sacred bond between brother and sister. 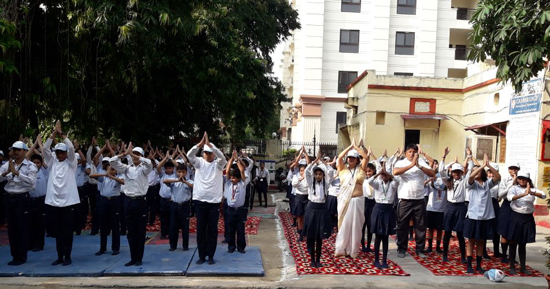 The students of Jopling Road campus basked in the glory of the spirit of independent Indians right from 8am to 10:30am through the medium of umpteen enthusiastic activities. 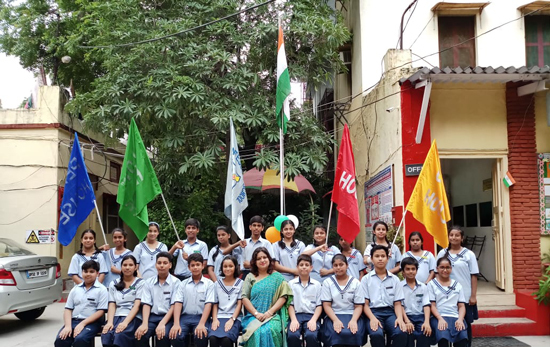 The Unfurling of the National Flag by the Principal at 8:30am was followed by the national anthem, and then patriotic songs like Vande Matram and “Sare jahan se accha” that puffed up our chest with pride as they reverberated in the school premises. The Investiture ceremony was conducted, badges were given and the office bearers pledged to deliver their duties to the best of their abilities and honour the trust bestowed upon them. 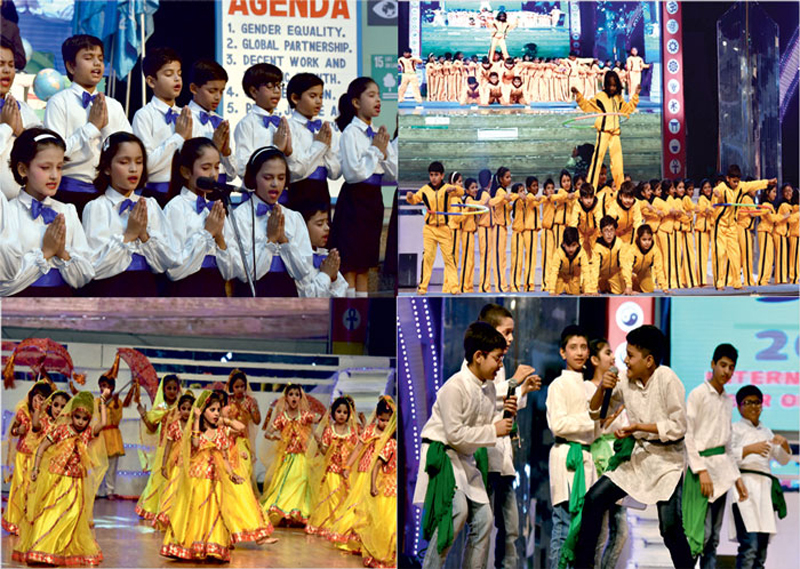 A variety of contests and activities were planned for the primary and junior children. 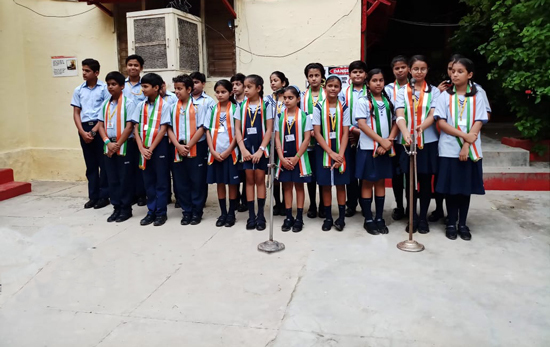 They participated in Hindi Elocution, Declamation contest and Singing competition house wise, in addition to what they have been doing in the class as part of the Independence Day week celebration. In class they did competitions like Salad making, Poster making, Slogan writing and card making. 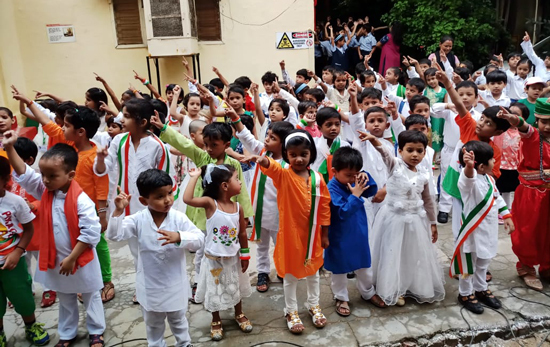 The Pre-primary students presented an action song- “Nanha Munna Rahi Hoon” and spoke brilliantly on national symbols-Montessori, National flag-Nursery and national leaders and words on Independence day-K.G. 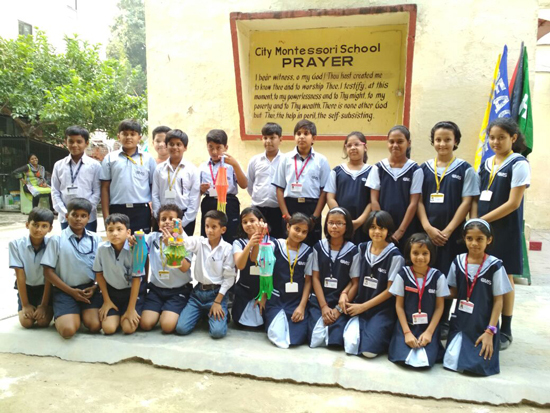 The Students of class 1 presented a patriotic poem- “Bharat Mera Pyara Desh”. The respected Principal appreciated each and every child’s effort and in her speech requested the students to value the efforts of the indomitable spirits who laid their lives for our freedom. 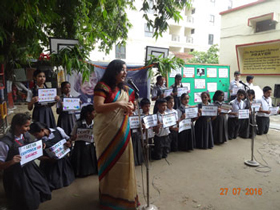 She reminded the students of their responsibilities towards their country in the present context. The old foes are replaced by new ones like terrorism, corruption, pollution and even social media! Students were sensitized regarding freeing themselves from the newer evils to understand the value of freedom in the real sense. 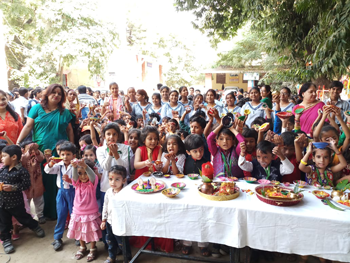 Sweets were distributed among children and all staff members as mark of proud celebration of 71 years of freedom. 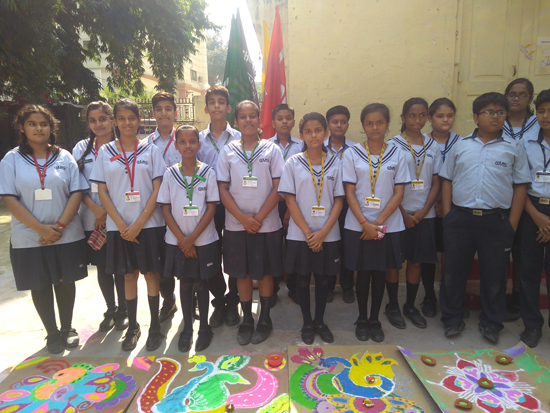 City Montessori School, Jopling Road Campus took part in the ‘Bharat Raksha Parv’ at the esteemed Hindi daily Dainik Jagran’s office. Dainik Jagran invited our students to give a musical presentation at Bharat Raksha Parv’ which was rendered beautifully and melodiously as much as to invite the complete elite gathering’s appreciation and applaud. The students sang ‘Aao Banaye ek jaisa jahan’ from the school song book and the patriotic song ‘Sare Jahan se achha ....’. 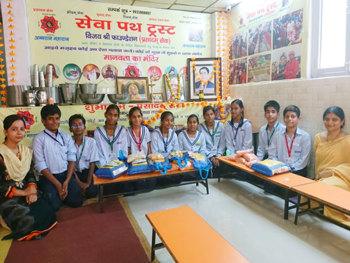 Our students also presented handmade Rakhis there to be sent to Siliguri via jagran’s Bharat Raksha Rath’for our revered soldiers at the border away from their families on festivals like Rakshabandhan too. The chief guest at the occasion was Mr. Jasbeer Singh Sandhu, DIG, Group Centre Bijnour, CRPF, who applauded. 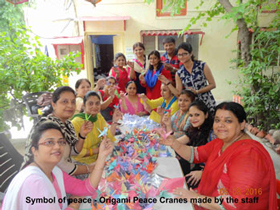 Finally the Bharat Raksha Rath was flagged off before us for its journey ahead with our gift of love –our handmade rakhis. 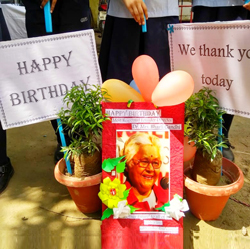 The beautiful date 8 th August 2018 became a reason to smile, celebrate and remember at Jopling road campus as the school celebrated the birthday of the most reverened Dr. Mrs. Bharti Gandhi, our Founder Director, in the special assembly at School. After the prayer and pledge the Principal introduced the significance of founder’s day. She also brought into light before the assembly the pioneering efforts of the Founder director in direction of setting up the school and making sure it touches the zenith of holistic education. 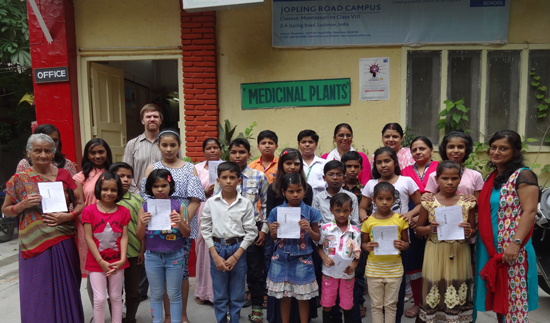 The picture of our founder, Pre primary kids with balloons and the Juniors planting saplings of the white pinwheel flower (chandni), Cards with wishes and thank you notes for our Mother Figure “Dr. 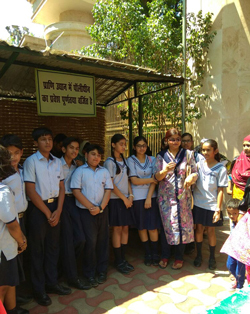 Mrs. Bharti Gandhi” became seamlessly the part of the assembly and gave immense satisfaction to the principal and the staff that despite her not being present. The NPP (No Plastic/Polythene) campaign by CMS Jopling Road Campus initiated in tandem with the Government ban on polythene and plastic, aims to reach out to the community and vehemently appeal to rise and act against the hazards and dangers of the use of polythene/ plastic which is a non biodegradable substance and chokes the natural eco system wherever it is disposed off thus shouldering the social responsibility of a school and complying to our bolder and broader vision of education at CMS. Time 12:45 pm on 22.7.18 (Sunday) – The play was witnessed by our respected Founder Manager Dr. Jagdish Gandhi and Director Strategy, Mr. Roshan Gandhi, Mr. Arun Tripathi, music coordinator, the script writer of the play Mr. U. K. Tripathi, visitors to the mall, staff and students of CMS, Jopling Road. Positive feedback of those who viewed the play was recorded and their words of appreciation for the children and the message spread by them is a great motivation for our entire team. Time 1:45pm – The play was performed inside the mall. It was our proud privilege again, to have our Respected Founder Manager with us to witness the play. Being a Sunday the footfall was high in the mall and the visitors enjoyed watching the street play by our young and enthusiastic green foot soldiers and were appreciative of Jopling Road campus’s unique initiative. 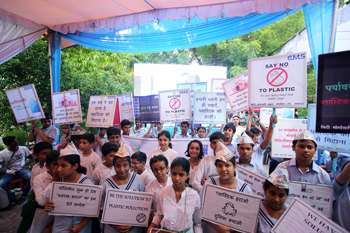 Our NPP campaign was further strengthened when we organized an event in the Lucknow Zoo to end Plastic Pollution. Our Respected Founder Manager took up the event very positively and enthusiastically. 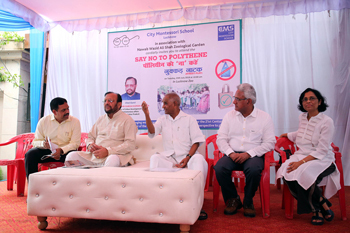 The chief guest for the program was Mr. Suresh Khanna, Urban Development Minister, Government of UP. He appreciated the efforts of our students to initiate this campaign whereby the students distributed 1000 paperbags to the visitors to the zoo. The Street Play was again very highly appreciated by him. It was also our proud privilege to have the Additional Commissioner of the Lucknow , the director of the Zoo, Mr. A. K. Singh and the joint director of the zoo Mr. A. Shukla. 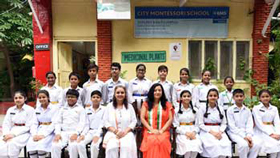 The children of City Montessori School, Jopling Road Campus gave a wonderful presentation at the World Unity Satsang on 29th July 2018 at CMS, Gomtinagar Campus I Auditorium. 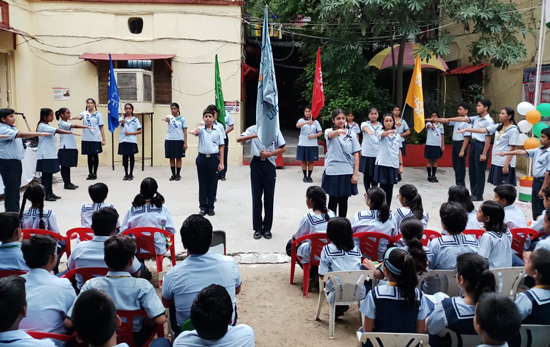 Ms. Sara of Class VIII extended a warm welcome to the parents in a speech which was followed by school prayer, pledge and melodious songs – “Oh What a Wonderful Day” & “We are one in the Spirit” sung by the school choir. The beautiful Dohas mesmerized the audience. A meaningful hymn “Good Neighbours” was rendered beautifully. 'Jai Jagat' song was sung beautifully by the students along with their mothers. 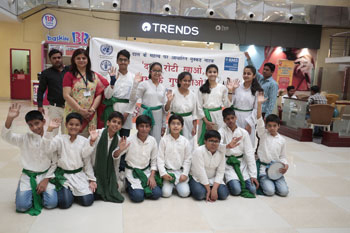 Finally the Nukkad Natak "हम ही औषधि हम ही मूल" based on hazards of using plastic and polythene that causes environmental degradation due to human induced activities sent a powerful message to the audience. The parents appreciated and applauded the efforts of the children. 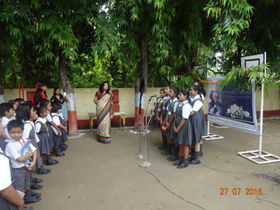 The Director Mrs. Bharti Gandhi blessed the children for their uplifting performance. Mr. A. K. Mishra and Mr. S. K. Pandey (Music Teacher and Dance Coordinator respectively) coordinated the programme. 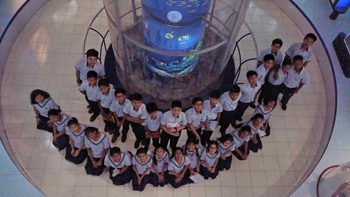 The students of class 5, 6, 7 & 8 of Jopling Road Campus visited the Regional Science Centre. It was a fun-filled learning experience. 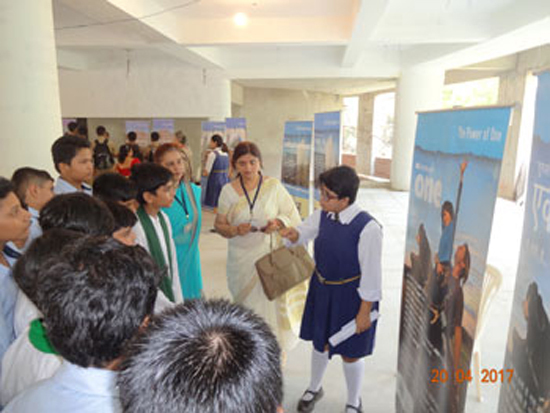 Close to nature and equipped with interactive science learning techniques, the Centre educated students about scientific facts in simple ways. Students enjoyed self help activities, observed simple machines and were able to appreciate nature. Not only were the students curious about the scientific process but they enjoyed some quality time sitting under the trees with friends. The trip enriched and relaxed them thoroughly. Earth Day was celebrated by taking a pledge in the assembly by holding the earth day flags. 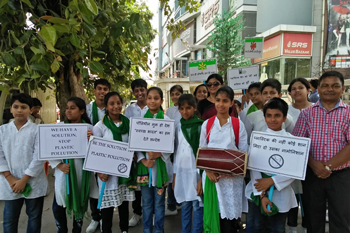 A signature campaign was also carried out, the theme being 'End Plastic Pollution'. 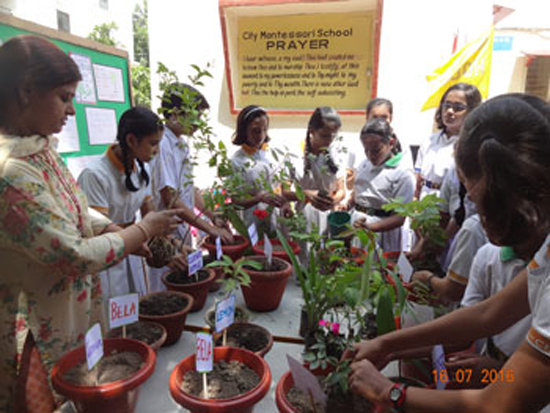 Students of class Junior Section planted summer resistant plants in used plastic bottles. The concept of vertical gardening was introduced to them. The pre-primary were dressed in blue and green symbolising earth. They also coloured art sheets on the topic 'earth day'. The primary took part in calligraphy, hand-printing, recited poems and played educative games on earth day. It was a great day to showcase environmental education, highlight efforts to green the school and engage everyone in making a difference. Chosen by the UN as it is both the birth and death date of William Shakespeare, the 23rd of April is World English Language Day. The celebrations of language are aimed to raise awareness and knowledge, and to create respect for the history and cultures linked to a particular language. Our Primary students celebrated by giving a presentation on 'Parts of Speech' which was followed by inter-house quiz on opposites, homophones, correction of sentences etc. Peace house came first with 45 points followed by Unity-35 and Love-30. 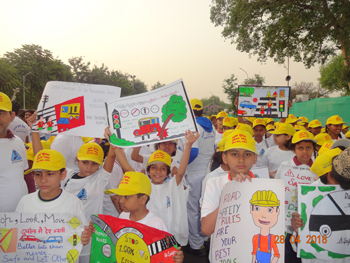 Our school participated in the marathon "Run for Safety" beginning from the Chief Minister's Official Residence, organised by the Transport Deptt, U.P. 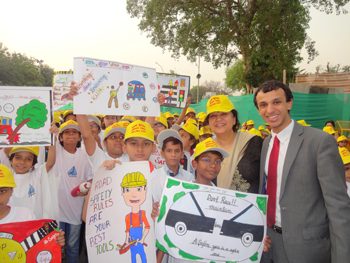 as a part of the 29th Road Safety Week. Unsafe driving is a serious problem and the CM urged everyone to follow traffic rules and sought co-operation of all sections of society in making roads safe. 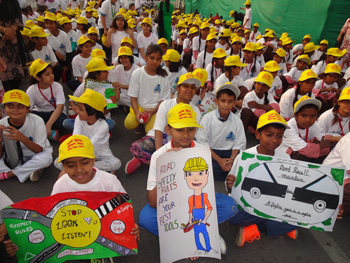 It was a meaningful participation because as a student they can implement innovative ideas regarding road safety and thus constitute a right direction for a better and safe future. Each participant was awarded a medal. 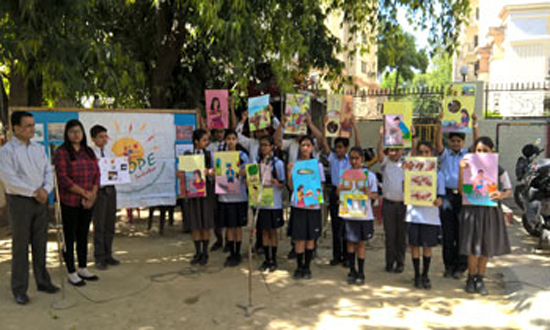 Our children eagerly participated in the poster making contest organised by U.P. Transport's Deptt. On the occasion of "Road Safety Week". The first,second and third prize winners were suitably awarded. The OSD to the Transport Minister Mr. Umang Modi gave a talk the students to sensitize them about road accidents and educated them about the rules on wearing seat-belts and helmets. Children learnt a lot as to how to walk safely on the road. The winners are- Sarah Rihab-1st, Zakia Jamal Atta-2nd, Sadaf Imtiaz-3rd. 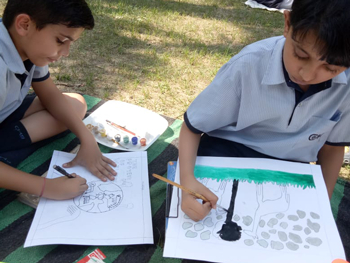 Students celebrated World Penguin Day which aims to raise awareness of the plight of these endangered species and highlight the importance of protecting the Antarctica's marine environment. 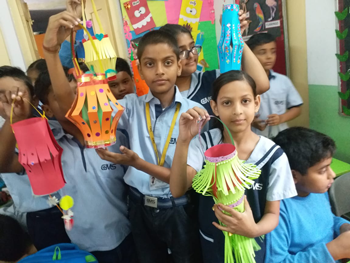 They made paper penguins and learnt interesting facts on these cute, adorable flightless birds, how they live and what we can learn from them. They also shared slogans to raise awareness--"Be Nice-Save Ice'. Penguins are on thin ice: stop global warming. One of the most towering personalities of Islam, Hazrat Ali Birthday was celebrated. His teachings and his knowledge were shared in the assembly by our teacher, Ms. Mohsina Khan. To quote a few-Knowledge gives life to the soul, To respect the learned is to respect God, Honesty is Divine language, The wise aim at perfection and many more were beautifully explained to the student. The teachings help everyone to be a better person by following the righteous path. A team from Good Shepherd Church visited our campus on the occasion of Good Friday and Easter celebrations. One of them explained the significance of resurrection of Jesus Christ. Through a few action songs they taught the children to be and innocent in all times. 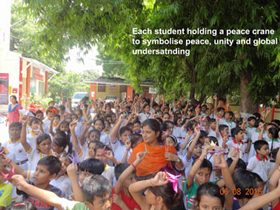 The children learned to celebrate the spirit of togetherness. On the occasion of World Health Day, a workshop was conducted by Mr. Jaideep Dhondiyal and Ms. Bindhu Anu from the HOPE FOUNDATION in the Junior and Primary assembly. They informed the students about the importance of Healthy hand washing and demonstrated the 7 steps by using soap and water. The students repeated the steps 7 times for re-enforcement. They were informed that soap and water should be used to create lather for 20 secs and then followed by the steps. This should be done 5 times a day. 70 percent of diseases such as diarrohoea, influenza, can be avoided if we adopt healthy lifestyle. 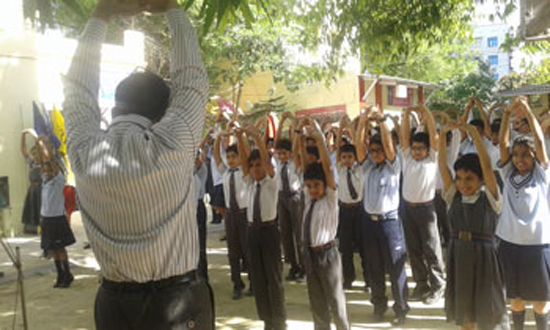 A pledge on the World Health day was also taken to be committed to healthy habits. The students were also asked to share their knowledge with family and friends. 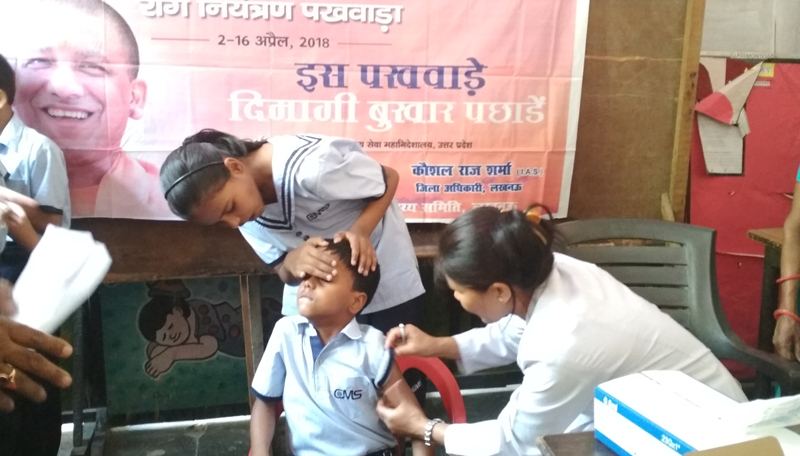 Children in the age group 1-15 were administered the vaccine against Japanese Encephalitis (JE), a mosquito borne disease with high fatality. This is a one time vaccination which is intended to give life time immunity to the children against the disease. The drive was a part of the Govt. sponsored mass vaccination programme being carried out in the city. The Chief Medical Officer appealed to the school authorities to co-operate with the conduct of the programme. Mr and Mrs. Diana Schaffter, author of a children's story-book "The Amazing Animal Race" visited Jopling Road campus to give a talk to the children. They motivated the children to bring passion in whatever task they decide to do. With passion comes purity in every work you undertake. They also encouraged the children to be life-long learners and be open to new ideas and not hesitate to share good ideas with others. The children learnt immensely in this motivating session. 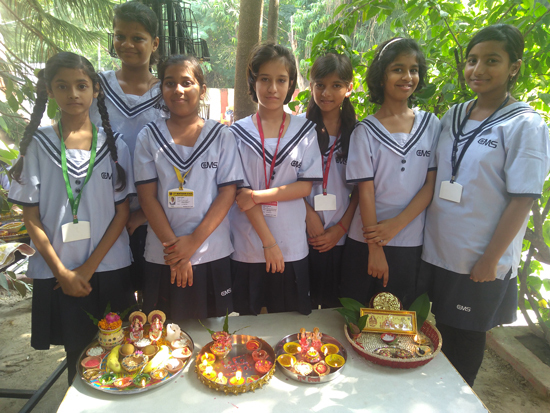 Students of Jopling Road Campus celebrated Baisakhi, Ambedkar Jayanti by sharing the significance of these festivals in the assembly. During Vaisakhi the farmers’ rejoice. The beauty of this festival also lies in where the great Guru Gobind Singh established the Khalsa Panth. 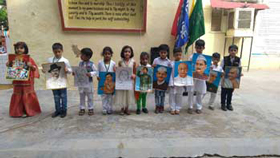 Students shared the contribution of Dr. Ambedkar for our constitution. 13th April also reminds us of the massive blood-shed at the Jallianwala Bagh where hundreds of innocent people were killed. 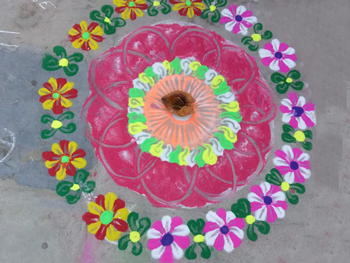 Festivals of lights-Diwali was celebrated at jopling Road campus by organizing various inter-house contests- Thali decoration, Rangoli, Bandhanwar and lantern -making. Every house displayed their items in an innovative way. In the assembly students talked about the significance of the festival- how good always conquered the evil. Besides sensitizing the students to the ill-effects of the crackers, they also shared guidelines on being safe while burning them. The celebration concluded with Principal Ma'am giving away the message of peaceful and bright diwali. The most admired TV Channels by the kids, The Discovery organized a written quizzing event called "Curiosity Contest" for classes 6-8. 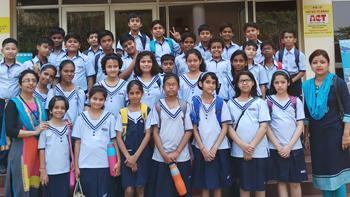 It was aimed to connect with the students directly and help them gain from the wide pool of knowledge accumulated by Discovery over the years. A six member Discovery team motivated the students to watch Animal Planet, Discovery Science, Discovery Kids and Discovery channel. A questionnaire on these particular channels was provided to them and the following students emerged as winners. 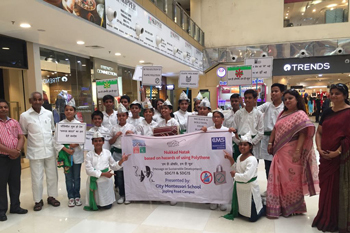 The FSSAI (Food and Safety and Standards Authority of India) conducted a campaign on Safe and Nutritious food under "FSSAI at school" initiative on 12th October 2017. Students from classes 3-8 participated in this session where they learnt about the importance of vitamins and minerals in daily life through an interesting and entertaining skit presented by the SNF and the Mascot team. The health mascots, Master and Miss Sehat, enthralled the students with their costumes and get-up and valuable tips.They advised to purchase milk in tetra packs with the fortification logo(sampoorn jeevan swasth jeevan). They also briefed about the significance of consuming fortified food, various deficiencies and how take precautions against any kind of disease. The children were also asked questions and the winners were given attractive prizes. 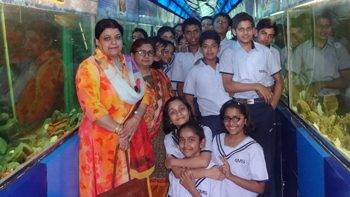 It was indeed a visual treat for all and was followed by photo sessions with principal, teachers and students. 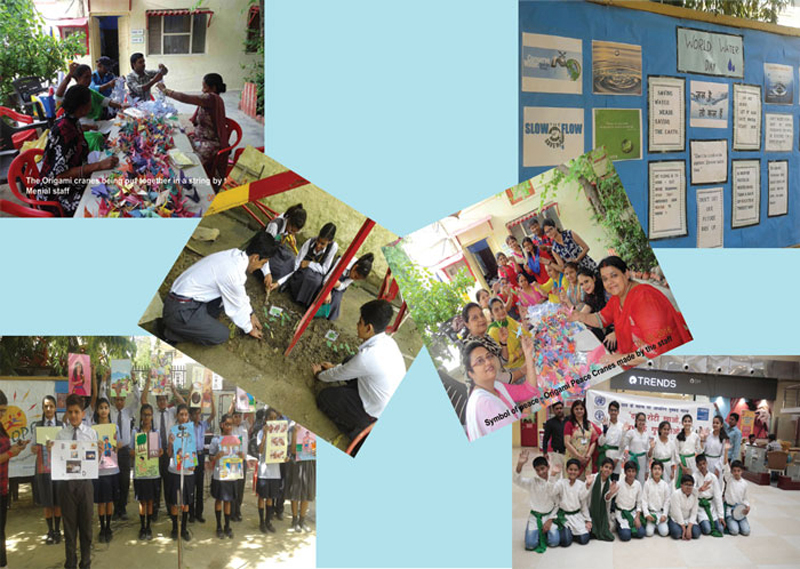 The efforts of the students of our campus who joined the Literacy Campaign –"Each one reach and Teach At Least one". were acknowledged by being awarded "Leader of Change" certificates at the 10th Ed Leadership International Round Table which was attended by eminent educationists and personalities- Mr. G.B. Patnaik, Chairperson. Indian Literacy Board, Dr. Sunita Gandhi, Lead, Facilitator. Worker, Global Dream. 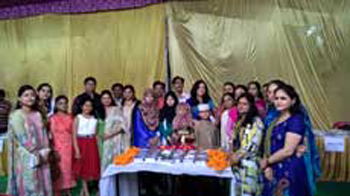 Mridul Rathi and Sameer Saxena of class VIII, Shatakshi awasthi of classVII, Riya Saxena, Khushi Kaushal, Anshima Shukla and Gargi Kumar of class VI, Vishrut Arya, Aanjaneya Singh, Anandini Gupta of classV were awarded to make Lucknow more literate. 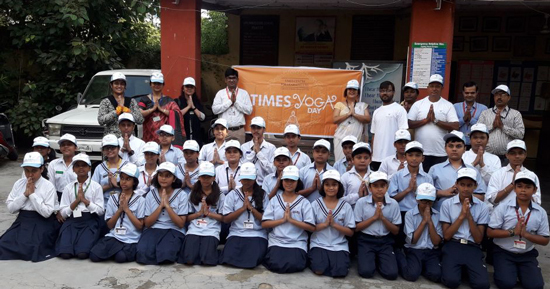 A Yoga session for classes VI-VIII was organised in our campus on 25th September by the Times Group. 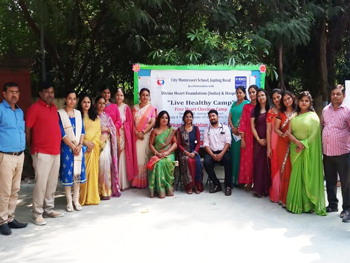 A team from Times Centre for Learning Ltd. conducted the workshop imparting yoga awareness and training. Students of Jopling Road Campus took part in a highly innovative tool-kit to promote literacy-The Global Dream Project. It is used as the curriculum to teach illiterate and under-privileged people to read. 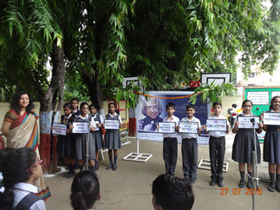 Our students gladly became a part of the "Each one reach and teach atleast one campaign. After successfully teaching their learners during summer vacations each volunteer got their learner to the campus for a Basic Literacy Examination conducted by Ms Mala Mishra (co-ordinator)and Mr. Jonathan(Teacher-Programmer) from the Global Dream. 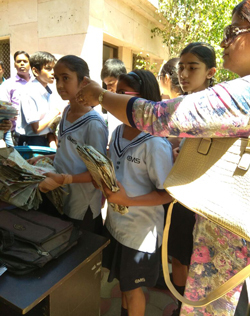 An interactive session motivated the children to do even better in their future endeavours. The Camlin Group conducted a Creative Writing Competition for classes 5, 6 and 7 in Jopling Road Campus. Students had to write a short essay of not more than 40 words on the topic "Saving Rivers:India's Lifelines". 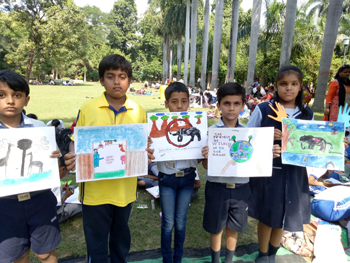 They were given Camlin Mechanical Pencils which save the environment.The contest aimed to sensitize the students about the rivers of our country facing a grave crisis. By participating the students became a part of a movement that pledges to save our dying rivers. The following students won first prizes. 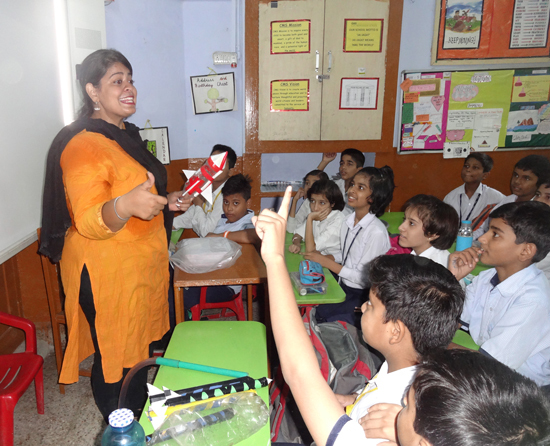 An astronomy workshop zero session was conducted in the school on Thursday, August 31, 2017 by Ms. Garima Malik and Mr. Raj Jaiswal from Labrynthe Pvt Ltd., New Delhi. 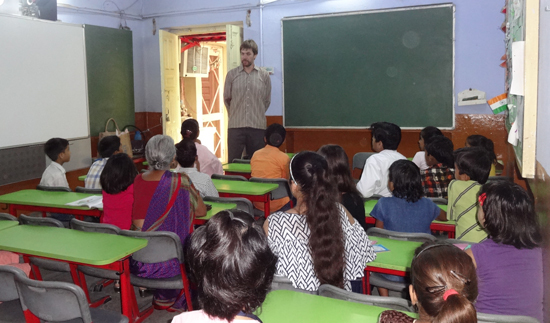 In this session the students learnt interesting things about Astronomy and space science. 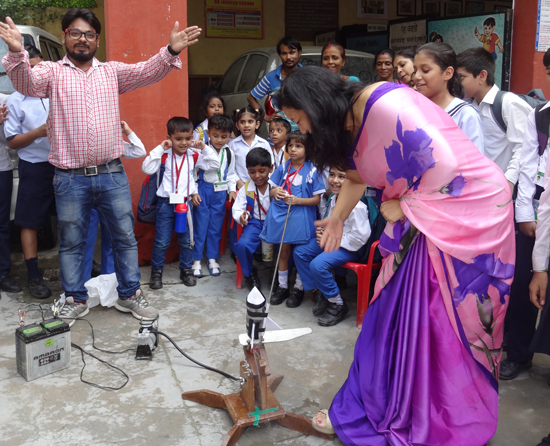 The attraction for the event was the mighty water – powered rocket launched by the school principal, Mrs. Manju Nautiyal. Seeing the rocket soar high in the sky, crossing the school field was a great fascination for one and all. 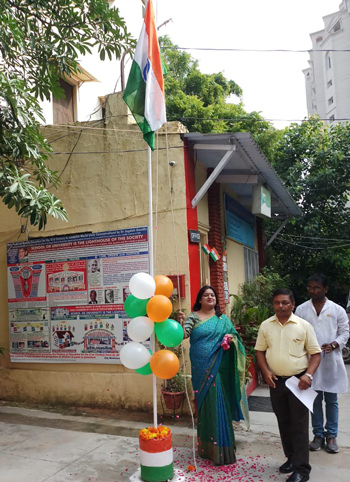 The students of Jopling Road campus expressed the feeling of unity and secularism as they participated in the 71st Independence Day celebrations. 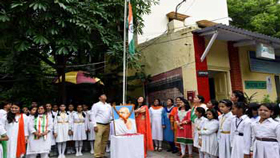 Unfurling of the National Flag by the Principal followed by National Anthem, Vande Matram and "sare jahan se accha' songs reverberated in the school premises. Investiture ceremony was conducted and the office bearers pledged to deliver their duties to the best of their abilities and honour the trust bestowed upon them. 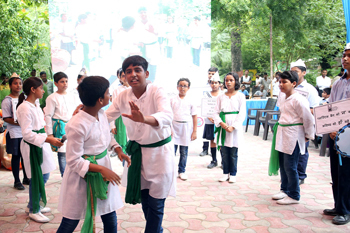 A plethora of contests and activities were planned for the primary and junior children. They participated in Hindi Elocution, Great speeches and Greeting card contests. 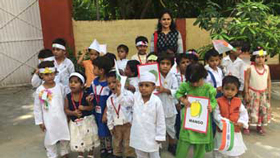 The Pre-primary students presented an action song-"nanha munna rahi hoon" and spoke brilliantly on national symbols-Montessori, national flag-Nursery and national leaders-K.G. Students of class 1 presented a patriotic poem- mere bharat mahan. 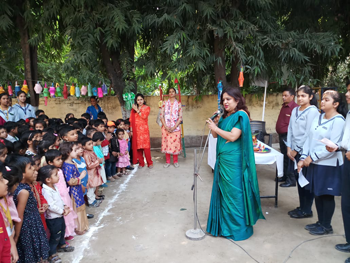 Principal Ma'am appreciated each and every child's effort and in her speech reminded the students of their responsibilities towards their country. The children were distributed sweets. 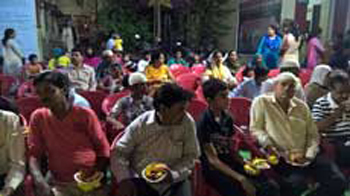 The Roza Iftar party held at the campus was attended by people of all religions. They displayed a spirit of togetherness while sharing a variety of dishes. 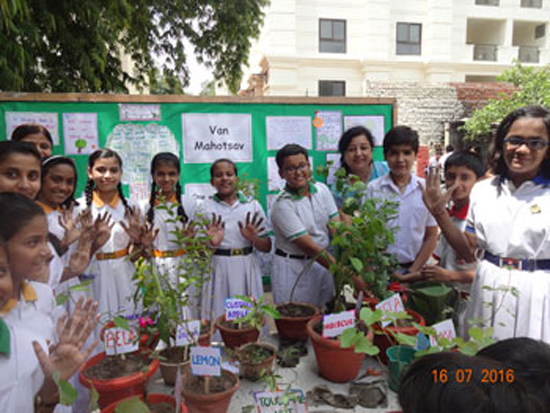 Our students of classes 6-8 visited La Martiniere College, to witness an Exhibition “Seeds of Hope: Visions of Sustainability”organized by an NGO Bharat Soka Gakkai International on Earth Day. They also performed a Street Play “Dal roti Khao, Prabhu ke Guun Gao” in the La Martiniere Premises. The play highlights the health, nutrition and sustainability benefits of pulses. it also aims to sensitise the students towards the consumption of junk food and health hazards thereof. Pulses are also climate smart crops. 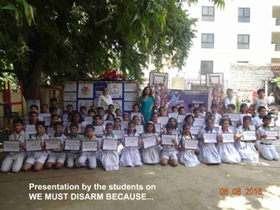 A workshop was organised by HOPE foundation conducted by Mr Jaideep Dhondiyal and Ms Arti Mishra. Children learnt tips for a healthy lifestyle. 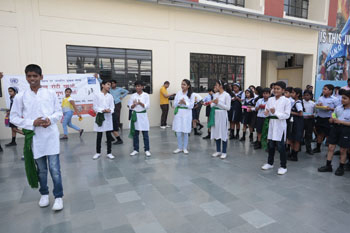 There were warm up exercises for children on World Health Day and demonstration of hand washing tips by Hope Foundation. 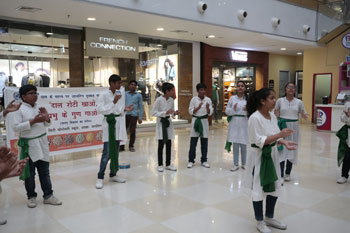 A Nukkad Natak titled “Dal roti Khao, Prabhu ke Guun Gao” was performed by our students at various strategic locations in the city like CMS, Gomtinagar I and City Mall. Our campus celebrated International Year of Pulses-2016 as a part of the 11th International Innovation day. 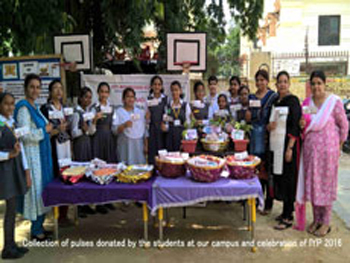 Our campus had organized many activities for the students to promote the awareness of pulses. 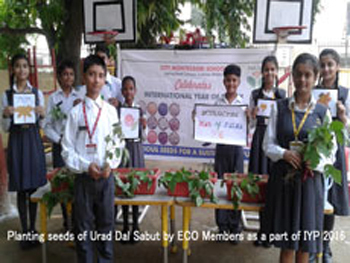 The eco-club members of our school very excitedly and carefully planted seeds of Urad dal sabut under the supervision of our school gardener and teachers who imparted them the required knowledge for the activity. 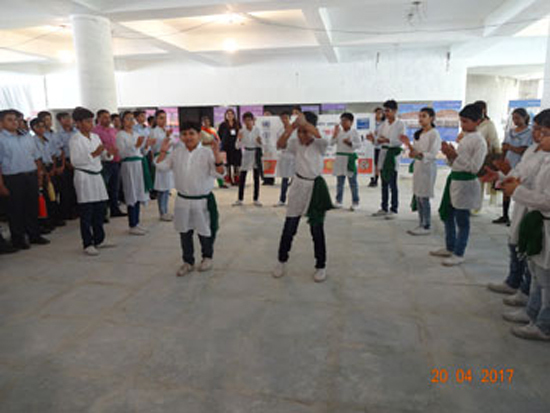 The Principal, staff and all the students took the pledge holding the flags of International Year of Pulses with its logo by Food and Agriculture Organisation. 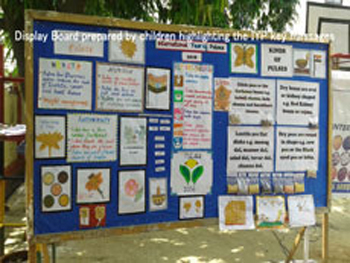 The students also prepared a display board highlighting the IYP Key messages and giving information on different kinds of pulses defined by FAO and attributes of pulses. The children further recited a very interesting poem on the importance of pulses "Pulses, The Magic Wand In Your Hand!". Our Principal wanted the parents of the children to be a part of IYP. Hence a letter was forwarded to them enclosing some valuable information on pulses and also requesting them to donate pulses for the poor and the needy. Our parents generously donated for this noble cause. The studentsof Jopling Road campus observed Hiroshima Day to mark the 71st anniversary of the devastation of Hiroshima due to the deadly attack by America during World War II and joined hands with millions of people of the world in this prayer to make a nuclear free world. 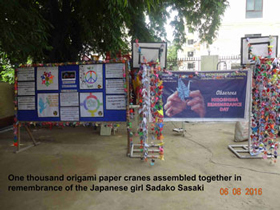 Our Respected Principal Ma’am, teachers, support staff and the students came together to fold 1000 cranes in memory of the Japanese girl. The students further took this opportunity to raise awareness about the threat of nuclear weapons by reading the “Hiroshima Appeal” launched in Hiroshima Japan in 1985. 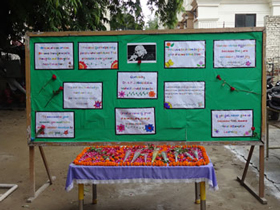 On 27th July our campus observed the 1st death anniversary of Dr. A. P. J. Kalam. Teachers and students paid floral tributes to the great leader. Students of class 5, 6, 7 & 8 spoke brilliantly on Kalamji. Sarah of class VI beautifully shared a brief life sketch of the Scientist. The children further spoke on our Annual Event IID. They shared a few snippets bringing out the personality of this great visionary. His passion for books, His faith and love for the youth, His love and respect for his parents and teacher/mentors were highlighted by the children. The tribute finally culminated with a powerful poem "Song of the Youth" delivered by class VIII. Bhavini Bahuguna administered the OATH OF THE YOUTH to every one present on the occasion.